It looks like Indiana Jones has gotten himself into some trouble yet again. Your goal is to take our hero and run like mad! Jump over obstacles, gaps, and try your best to go the distance. Released by Ravenous Games, Cave Run is available on the iPhone, iPod touch, and iPad, for $0.99 for a limited time at the time of writing. Let’s start with the first thing you see: the graphics. The art for the cave is extremely well done with a cell-shaded look. Foreground and background elements move at their own pace and really give the impression that there is some depth to the level. Each time you run a ‘level up’ by running a certain distance, the cave will sometimes change colors to a tan cave or gray cave or some mixture of the two. The character is a cute little round character that looks like a Charlie Brown version of Indiana Jones. He runs, he flaps his arms, and he stumbles. 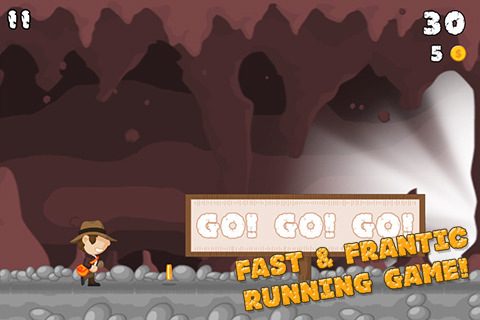 All nicely animated for your running adventure. The music is actually pretty good, but it’s forgotten when the level is moving a million miles a minute and you have to be extremely careful when you jump. The controls are extremely simple. You tap the screen and you jump. The longer you hold down on the screen, the higher your jump will be. You use this one tap control system to jump over gaps, mini-volcanoes that launch you into the air uncontrollably, iced paths that cause you to lose control for a short time, and other obstacles that usually end up killing you if you run into them near a pit. To level up, you have to run a good distance while collecting coins in the path. Alright, let me just touch on some things that could use some improving. First would be the level up notification. Whenever you hit a certain distance, a giant bold “LEVEL UP!” will flash the screen white and block the screen for a half a second. If the stage’s platform is in the middle of the screen, the LEVEL UP! notification will block the screen and has caused me to run into the traps and obstacles that come extremely quickly at higher levels. There is also a strange glitch I think. If you jump a gap, no matter what speed, with just a slight tap, you’ll do the smallest jump available and if you land on the platform at the edge, you’ll fall through and die. I don’t know why since I always see that I landed on the platform graphically, but the platform doesn’t detect me apparently. This is easily solved by holding the screen a tad longer to jump higher and land a bit farther in the next platform. Besides the two minor issues, this is a solid game with an interesting theme and gameplay style. I enjoyed it but I really want to see this game extend on the theme. Maybe a forest/ancient temple background or some kind of level where you run away from a giant rolling boulder? That would be awesome. 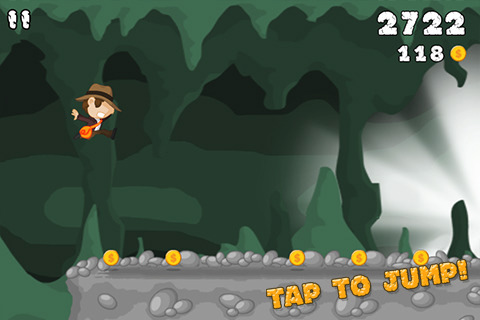 AppSafari review of Cave Run was written by Joseph Ho on August 31st, 2010 and categorized under App Store, Games, Platformer. Page viewed 5404 times, 4 so far today. Need help on using these apps? Please read the Help Page.